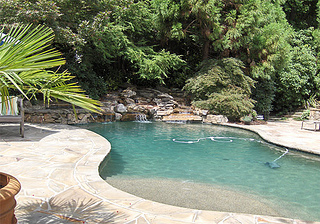 Fiberglass pools are a popular choice. They normally come in circular or oval shapes, and they are suitable for any yard as they are low maintenance and very attractive. Their shapes can be integrated into the landscape by building decking around them. However, in the case of a small yard, instead of surrounding the entire pool with decking, and using up space that you can ill afford to lose, you may want to consider installing the pool closer to a barrier such as the house or a fence. This limits access to the pool to only one or two sides, but also reduces the materials necessary to make your project look complete and takes up less space too. Many homeowners want the low maintenance of a fiberglass pool, but don’t think they can get it on their site. Luckily, they are light and can be hoisted over a home with ease. In fact, this is quite a common occurrence as fences, garages and other structures often block access to the backyard. Over the last decade, fiberglass has become the favourite by far. The low maintenance and attractive designs make them a serious contender for any yard – even a small one. Another excellent choice is an above-ground pool. Today’s pools can be as permanent or transitory as you wish. Steel pools sit well on the property and may last for decades. If you surround them with rocks, plants, and other landscaping elements you can create a small backyard oasis with a very natural appearance. 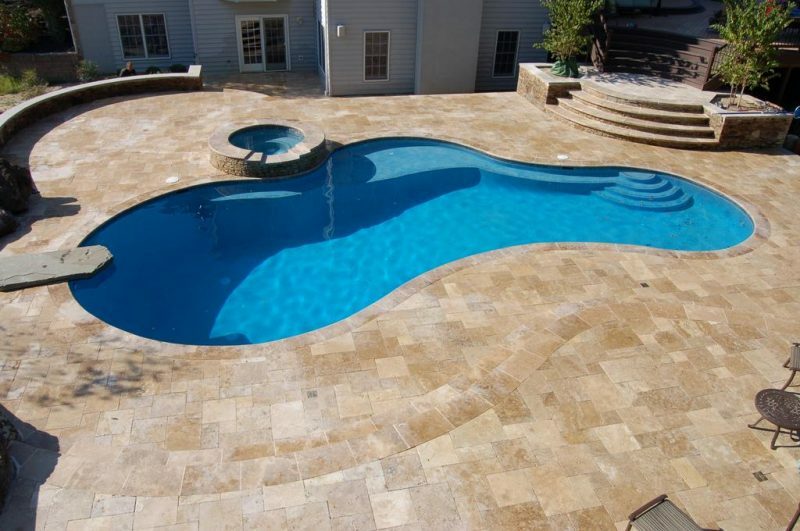 L-shaped or curvy pools allow for more decking area around the pool when space is at a premium. Tables and chairs can be tucked in the curve of the pool, instead of extending into the yard. If you don’t think that you could even get a pool on your site, remember that above-ground pools are transported in pieces and assembled on your property. Even so, these pools can be very permanent, particularly the steel models. If you are anticipating a move in the future, you also have the option of buying an aluminum pool that can be disassembled and relocated, if need be. You may also want to include a water feature at one end of your pool to give it a luxurious touch. Waterfalls, small fountains, water walls and cascades all add interest with little or no extra space required. Even a circular or oval pool can be dressed up with a bit of creativity. Pools for swimming and fun need not be big. Shallower, smaller pools are safer, less expensive to run and maintain, and of course they cost less too. Many pool owners say that they don’t even use most of their pool and they wish they had gone smaller in the first place. When it comes to finding the right pool for you, Elitepools.ca can help. Contact Elitepools.ca today to talk to a swimming pool professional about what swimming pool is right for your small space.